In recent years – 1989 being, of course, the significant starting point – a wave of artistic practice on the margins of official channels has crashed over China, and has garnered a multitude of periodising terms. All of these terms, I believe, have merit as well as an appealing flair, and before the reader becomes too suspicious or pessimistic, let me assure him or her that I do not intend to take any of these labels to task. A number of international exhibitions now have celebrated the underground shows of experimental artists, many of whom are part of a close-knit group of ‘nomadic artists’ working in artist villages around Beijing. Last winter’s exhibition at the Guangdong Museum of Art, Reinterpretation: A Decade of Experimental Art in China, 1990-2000, was a comprehensive appraisal of these curatorial and artistic developments that, in the English language, employ such headings as ‘experimental art’ or ‘avant-garde practice’ to cover work that includes painting, photography, video art, and especially installation work and performance art (1). Recent Chinese cinema also has become constituted as a subject of appraisal, whose filmmakers are referred to, sometimes interchangeably, as the ‘Sixth Generation,’ ‘independent filmmakers,’ ‘underground filmmakers,’ or the ‘Urban Generation’ (2). Broadly defined, these filmmakers are generally thought to be made up of the Beijing Film Academy class graduating after the internationally renowned ‘Fifth Generation’ class. (However, some directors who are not alumni of the film institute, such as Jia Zhangke, are also considered part of this larger movement.) Diverging from their predecessors’ interest in epic renderings of a historical, rural China with support from the state studio system (see, for example, works by Chen Kaige or Zhang Yimou), the recent independently financed (and, therefore, often extra-legal) films like On the Beat (Ning Ying, 1995) Lunar Eclipse (Wang Quan’an, 2000), or Suzhou River (Lou Ye, 2000) offer a vision of the underclass in contemporary urban China. A number of critics have pointed out the “documentary impulse” of the films of the urban generation (3). This impulse stems from the off-the-cuff location shooting of the films, the prevalent use of non-professional actors (Ning Ying’s films provide the best examples), and their shared concern with tracking the often violent social transformation happening today in the cities of China. A few of the well-known feature filmmakers have made documentaries as well. For example, Jia’s wonderful documentary, In Public (2001), seems like a primer for his later film, Unknown Pleasures (2002). Here I want to discuss a ‘performative impulse’ in the equally vibrant movement of the recent Chinese documentary film. 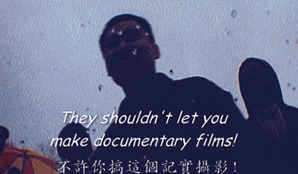 Prior to the 1990s, essentially all documentaries produced in China were of the scripted-lecture, talking-head form for television. Television has continued to be a major avenue of exhibition for the recent documentaries, with the ‘new documentary movement’ occasionally referred to as the ‘DV movement’ in appreciation of the liberating technology of the small digital-video camera. However, recent independently produced documentaries employ something more akin to a verité form while also placing heavy emphasis on ethnographic responsibility and research, often involving the filmmakers living with their poor, marginalised subjects for an extended period of time. But as a number of these documentary filmmakers are also friends with the new experimental artists in China, they have also made works documenting various forms of performance, including some showcasing recent performance art. Such works include Dance for Farm Workers (Wu Wenguang, 2001), but we should also note the exploration of more vernacular modes of performance: the traveling circus in Jiang Hu: Life on the Road (Wu Wenguang, 1999); a rural opera troupe in The Story of Wang Laobai (Lu Wangping, 1996); the ‘Crazy English’ language instruction lecture-circuit in Crazy English (Zhang Yuan, 1998); or underground rock scene in Who Is Listening for My Son? (Mao Ran, Jiang Zhi, Cao Fei, and Cui Xiumen, 2003). My discussion of performance brackets attention to these and other fascinating documentary works chronicling, for example, the impact of recent social changes in China on the traditional working class, migrant laborers, and the displaced in films such as Along the Railway (Du Haibin, 2000) and Tiexi District (Wang Bing, 2002) (4). So I won’t here be able to offer a comprehensive history of the new documentary movement, especially as I will narrow my discussion to one film in particular: The Other Bank (1995) (aka The Other Shore), directed by Jiang Yue and assisted by (and including discussion with) one of the most prominent of these new documentarians, Wu Wenguang, who, with choreographer Wen Hui, also runs China’s first independent dance company, Beijing’s Living Dance Studio (5). The Other Bank follows the creative process in the production of Mou Sen’s performance-theatre work, “The Other Bank,” providing intimate close-ups of the intense physical labour of rehearsals and set production (also done by the actors). The ‘theatre’ is a classroom at the Beijing Film Institute, while the actors are visiting students for a single semester project; as a viewer, one feels contained within the walls of what begins as a bare space. Then we are witness to the actors transforming that space. First, newspaper is plastered on every visible surface of the room, from the walls to the pipes to chairs. Then so many ropes are stretched between various points across the room – no longer can this be a conventionally frontal theatre, as the lines of perspective created by the ropes extend into a surrealist space with three dimensions but no centre of gravity. When the performance date finally arrives, spectators surround the actors, looking down on them from high catwalks. What is the “other bank”? I suspect the performers never know what it is (either as characters or as actors – again, the border between the two is tenuous, a rope that might break at any moment). Considering how “the other” in post-colonial discourse is often necessarily defined in the negative, we might ask what is the bank that they are on, i.e. what is the place they are they trying to leave? Is it the rural hometowns that they want to leave for the city lights of Beijing, a passage that also leads away from their peasant class status to that of the upwardly mobile and elite status of artists? Or are they, like the actors in Dance for Farm Workers, leaving the disintegrating economy of the countryside in hopes of just finding any job, like, for example, that of a karaoke hostess? Are they trying to leave China for the West? Political repression for political freedom? Or are they trying to leave the confines of a play and its theatrical space for the expanding landscape of reality itself, from the performance to the documentary? Performance art is by definition an ephemeral art that only exists in the present, and Peggy Phelan argues that performance “cannot be saved, recorded, documented, or otherwise participate in the circulation of representation of representations” (6). What, ultimately, is the film The Other Bank documenting? Berenice Reynaud writes that upon her first viewing of some of the documentaries mentioned above, she had the sensation of watching the documentary form being (re)created before her eyes (7); in The Other Bank, as well as in films like Dance for Farm Workers, we of course have the sense of the documented – the subject of the film – being created as the film unfolds, to the point where the documentary form and the dance/performance form are inseparable, part of the same creative impulse. This impulse, then, is the very act of ‘performative writing,’ producing a document that does not just explain or describe, but rather acts, or, to paraphrase J.L. Austin, “does something with words” and images (8). Phelan writes that all a record of a performance can do is suggest or invite a memory. Undoubtedly, the bittersweet memories of performing “The Other Bank” constitute much of the film. But like many of the documentaries previously mentioned, The Other Bank surpasses this ontological definition. The Other Bank definitely does not just memorialise or commemorate the performance of the play. While the bulk of the first part of the film concentrates on the production and performance of the play, the latter consists of a symposium following the event, interviews with the actors and observation of their lives thereafter. For the student actors, appearing in “The Other Bank” was their first training in the arts, as visitors to the Beijing Film Institute for a special four month session; the intensity of the workshop inspired many to dream of a career in film or theatre. One of the key questions Jiang asks of the students lingering in Beijing after the end of “The Other Bank” is if they are still trying to find another ‘other bank’? After the workshop’s conclusion, Mou planned another play, entitled “AIDS,” and expressed interest in using the actors from “The Other Bank” in this new play. All quit their jobs and returned to Beijing in hope of working on the new play, but the sources for funding fell through. Disillusioned, they felt betrayed by Mou and hopeless in their utter poverty. Many resist the memory of the other bank – “there are no new other banks.” The documentary thus not only records the performance but enacts a distance from it. The haptic space created by the documentarian’s camera produces a tangible sense of the labor of rehearsal and performance, but then also manufactures the residue of live performance – the energy, excitement, and fame that dissipates for the actors. The film could have ended at this point, having explored the creative process and exposed the very articulate and sensitive memories of the performers. But the film has one final performative objective, in which the project of joint creative act via live performance and documentary reaches greater heights. The film follows one of the actors (Cui Yapu) from “The Other Bank” as he returns to his farming village in Hebei Province to work on the family farm but also to write and act in his own play, “A Black Bird Flying Over Paradise.” Two more of his classmates (Zu’er and Tang Changlian) complete the cast, and Mou, his wife, and of course Jiang visit his home to attend the performance. The play is staged in the middle of a field, where a few wooden poles and holes in the ground mark the scene. No longer are they confined by the walls of a classroom; instead, the empty field stretches out to infinity, as the fog hides the horizon. The audience, primarily made up of the local villagers, do not sit and watch but stand, surrounding the actors and in effect becoming part of the scene. In the play’s opening stages, we realise it aspires to produce something that will last beyond an ephemeral moment of performance: the actors try to fix an old tractor (to pay for the tuition of him and his siblings, Cui’s parents had sold their working tractor), eventually enlisting the help of some in the audience. A key moment then occurs when the documentary fulfills its performative impulse. The camera frames Cui and Zu’er arguing; Cui exits off-screen, and Zu’er calls out to him. The camera maintains its framing of the original shot, then tracks back to a close-up of Cui for his reaction. Such a form-specific maneuver within a set containing no walls begs the question: are we still watching a record of a play, or are we watching a story unfold as we would in a fiction film? A documentary of a performance-theatre piece has transformed itself into a narrative fiction film and has produced something many of the actors hoped to find on the other bank: a movie career. Have they now ‘made it’? For more information on this exhibition and recent curatorial and artistic practice in China, see the exhibit’s catalog, Wu Hung, Wang Huangsheng, and Feng Boyi, eds. Reinterpretation: A Decade of Experimental Chinese Art: 1990-2000, Guangdong Museum of Art, Guangzhou, 2002. For more on recent independent filmmaking and especially an exploration of the ‘urban generation,’ please see Zhang Zhen, “Mediating Time: The ‘Rice Bowl of Youth’ in Fin de Siècle China,” Public Culture, Winter 2000; Zhang Zhen, “Building on the Ruins: The Exploration of New Urban Cinema of the 1990s,” in Wu Hung et al. ; and a forthcoming collection of essays on the ‘Urban Generation,’ edited by Zhang. I borrow the phrase “documentary impulse” from Yomi Braester’s conference paper “Shards of Memory: Chinese Urban Cinema from Trauma to Nostalgia,” presented at The Urban Generation: Chinese Cinema and Society in Transformation, a symposium held at New York University in 2001. For surveys of some recent developments in Chinese documentary, I recommend Bérénice Reynaud, “New Visions/New Chinas: Video-Art, Documentation, and the Chinese Modernity in Question,” in Michael Renov and Erika Suderburg, eds., Resolutions: Contemporary Video Practices, University of Minnesota Press, Minneapolis, 1996; Chris Berry, “Chinese Documentary at Home in the World,” Documentary Box, January 31, 1998; and Chris Berry, “Facing Reality: Chinese Documentary, Chinese Postsocialism,” in Wu Hung et al. Wu, Wen, and the Living Dance Studio recently toured with their performance piece, Report on the Body. Wu is also one of the underground film and art scene’s more interesting critics. Among his other writings, see, for example, his recent monograph. Document: Xianchang (“Document: The Scene”), Tianjin Institute of Social Sciences, Tianjin, 2001. Peggy Phelan, Unmarked: The Politics of Performance, Routledge, London and New York, 1993, p. 146.